Maximize your fundraising success through this timeless course that teaches the tried-and-true practical skills of effective fundraising. Strengthen your fundraising abilities by learning proven fund development tools, and draft a specific fundraising plan to grow your organization. This course serves as the foundation for the rest of the curriculum. Rochester, MI April 23, 2019–April 26, 2019 $1,595 Full. Please email tfrs@iupui.edu to be added to the wait list. Chicago March 23, 2020–March 26, 2020 $1,595 Registration opening soon. Washington, D.C. March 30, 2020–April 2, 2020 $1,595 Registration opening soon. Indianapolis April 27, 2020–April 30, 2020 $1,595 Registration opening soon. Principles & Techniques of Fundraising is offered in-person in multiple cities or online. The in-person class is four days in length. Day 4: 8:30 a.m.–5 p.m. The online course is eight weeks in length. The location next to each course date indicates if the course is being held in-person (e.g. city name) or online. For in-person classes, please click on the city name for further details and recommended hotel accommodations. Principles & Techniques of Fundraising qualifies for 27.0 CFRE Education Points/Hours. The baseline course for all of The Fund Raising School courses. Recognized internationally, Principles & Techniques provides you with the foundation and inspiration to achieve your organization's financial goals. This course presents the total framework for operating an accomplished fund development program. In just four days you will gain A-through-Z knowledge and skills that are essential for fundraising success. 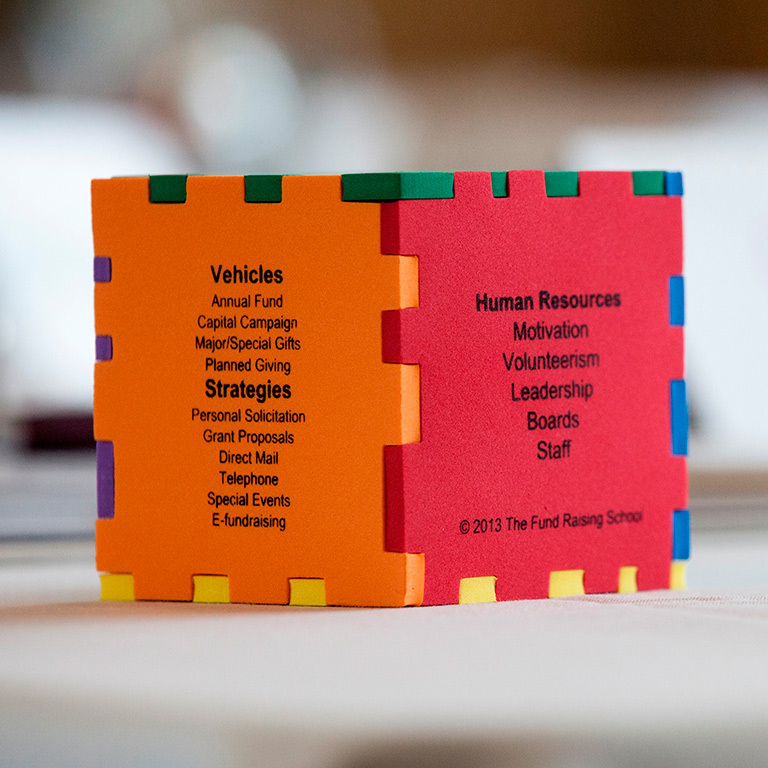 The Fundraising Cube is a colorful desktop reminder of The Fund Raising School’s internationally-regarded fundraising management process. This handy reference is a source of pride for alumni.